Are you thinking about adopting a Rottweiler puppy? If so, there are many things to consider first. Following, I would like to give you some insight on how to decide if a Rottweiler is right for you, where to find your puppy, and what you need to do to prepare for the arrival of your new puppy. Is a Rottweiler Puppy Right For Me? Whenever we introduce a new pet into our homes, we must consider a few things. Is my home appropriate for the puppy I am bringing in? Am I going to be able to handle the responsibilities of owning a puppy? Is a Rottweiler the right breed of dog for me? A puppy will always grow up to be a dog. We all know this. But a Rottweiler is a pretty large breed. They will need lots of room to stretch out and run around. A home with a yard is prefered when deciding to get a big dog. 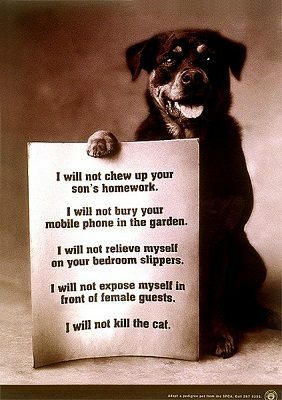 If you do not infact have a yard, this does not always count the Rottweiler out for you. If your home does not have a yard, it is important that your new puppy will have someplace where you can walk them. A Rottweiler requires a lot of exercise. It will be up to you to make sure they get the proper amount of exercise to keep your energetic puppy occupied. You will also need to prepare your home for the arrival of your new puppy. This means puppy­proofing everything. You will need to decide where your puppy is going to sleep. Whether it is a crate, a bed, or a blanket, you will need to designate an area for your puppy to feel safe, comfortable, and happy. 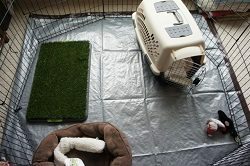 Also, you will need to decide which rooms the puppy will have access to. If you do not want your puppy chewing up your shoes, leave your bedroom door closed at all times so the temptation is not there. You may need to invest in a baby gate to keep your puppy in a controlled environment, especially when unsupervised. This will help prevent accidents like chewing up furniture, or messing on the floor where it cannot be easily cleaned. Remember, accidents happen. Especially with puppies! So prepare for them to make several messes on the floor before they become comfortable and house­broken. If you are planning on adopting a new Rottweiler puppy, there will be many things you become responsible for. First and foremost, you need to prepare your home for the arrival of your new puppy, which was explained earlier on. To recap, make sure you have a place for your new puppy to sleep and be comfortable, make sure you have someplace where they can be contained while unsupervised, and prepare your yard. For the yard, you will need to make sure there are no holes in your fence that a puppy can slip through. Also, make sure you designate an area of your yard as the “potty spot” so you can train your puppy to go to the bathroom in an area, and not in your garden or right outside the back door where you or your guests can step in it. If you do not have a yard, make sure you take a walk through your neighborhood and find a safe route for you and your new puppy to walk. 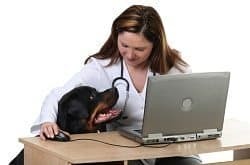 You will need to select a Veterinarian for your new adopted Rottweiler puppy as well. They will need to get shots and check­ups as puppies so they are healthy. Puppies are like babies. They are susceptible to diseases, viruses, and parasites. They must be vaccinated at an early age so they can remain healthy. It is not uncommon for a puppy to be born with parasites, so it is important to get them to a vet right away to make sure they are healthy. Financially, you must decide whether you can afford to take care of a Rottweiler puppy. You must budget their food, regular vet visits, flea and tick treatment, grooming, and other various pet supplies. It can be expensive to take care of a puppy. And remember that a Rottweiler will grow to be quite large, so you will have to plan your budget to take care of a large breed dog. 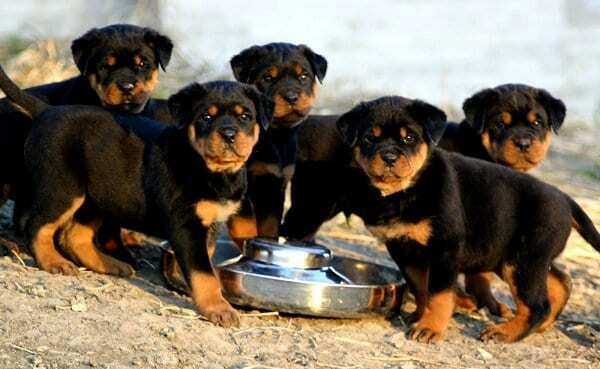 When planning your Rottweiler puppy adoption, you must decide whether a Rottie will be the right breed for you. They are a large breed, so you must decide whether or not you can handle a big dog like the Rottie, and whether or not you have the time to commit to your new puppy. Rottweiler puppies grow into big dogs. You can expect your Rottie to grow to around 75 to 105 pounds (35 to 48 kilograms) for a female, and 110 to 130 pounds (50 to 60 kilograms) for a male. So you must decide if you will be able to handle a big dog like the Rottie. The Rottweiler as a whole is very good natured. They are obedient, intelligent, loyal, and eager to please. They are self­assured, fearless, and levelheaded. But they can have aggression issues. This is something that as the owner of the puppy, you must recognize early. If you experience aggressive behavior in your puppy, you must take time to address these issues before they become full grown and dangerous. You can easily spot aggressive behavior by observing them during feeding time (do they growl or snap when they are getting fed? ), in social situations (at the park or on your walks, do they growl or snap at people or other animals? ), and during playtime (do they growl or snap when you try to take their toy away from them when you are playing?). If so, then you must address these issues with proper training. Rottweilers have gotten a bad name recently in the media due to dog­fighters misusing this breed. The Rottweiler has been a victim of abuse, so be sure you adopt your puppy through a trusted source. There are many breeders out there that have bred these wonderful dogs to be aggressive, so make sure you choose a breeder that has positive reviews. As far as health issues are concerned, the Rottweiler tends to be a fairly healthy breed. There are a few health issues that go along with owning a large breed dog to consider, though. Rottweilers are prone to hip dysplasia, which is a common hip problem, and Osteochondritis dissecans, which is a shoulder problem. These health issues are standard when you own a large breed dog. They are also prone to cancer, which is generally the main cause of early death in the Rottweiler as a breed. And with any large breed dog, weight is a big concern. They are also prone to obesity, so it is important to feed your Rottie a healthy diet, and to be careful not to give them too many treats. Overfeeding and lack of exercise are the two main causes of obesity in Rottweilers, so control their diets, and give them plenty of exercise. Now that you know what to expect when adopting your Rottweiler puppy, you need to decide where your new companion is going to come from. It is important to do lots of research to find the right puppy for you. There are many breeders out there that you can adopt your puppy from, but you must use extreme caution. Many breeders are very concerned about their puppies being healthy and good natured, but there are plenty of them out there that are breeding for the wrong reasons. These particular breeders are usually only in the business for making money. Sure, all breeders want to make money, but there is a difference between a breeder who genuinely loves the breed and wants their puppies to be happy and healthy, and a breeder who just wants to breed as many puppies as possible, and are not concerned about their health, temperament, or safety. These are the breeders you must watch out for. You want to find a breeder who is caring and concerned with their puppies’ well being. When choosing a breeder, do your homework! Check their resources, their reviews, and even visit them beforehand. A breeder will respect a buyer who comes to check them out. That gives the breeder peace of mind knowing that they will be adopting out a puppy to a loving and caring home. Just because you want a Rottweiler doesn’t mean you can only get one from a breeder. 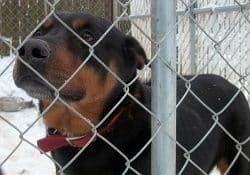 There are shelters filled to the brim with Rottweilers. This can be a riskier way to adopt your Rottweiler, but shelter puppies make great pets as well. Unfortunately, when adopting from a shelter, you generally will not be able to check on the puppies background like you can through a breeder, who may have both parents with records on hand to check out. But do not let this discourage you from adopting from a shelter! You can find great pets at shelters, but you do run the risk of adopting an aggressive, or unhealthy puppy. You can also search for your new puppy through non­breeders. There are many people out there who have Rottweilers. Some of them don’t have their dogs altered. When this happens, you tend to get puppies. It is perfectly fine to browse the pet section of the wanted ads to find your new puppy. But, just like with adopting from a shelter, you must be careful that you do not adopt a sick or bad­natured Rottie. Make sure you check out the puppies first to see if they are healthy, playful, and well taken care of. Another place you can search for your new Rottweiler puppy is at your local pet store. I have heard many people say that most of these dogs come from puppy mills, which tend to offer unhealthy living environments and inhumane breeding tactics. This, though, does not mean that you cannot find a great puppy from a store. It just means that you must be extra careful and use your best judgment when selecting a puppy. Make sure the puppy is responsive, friendly, and approachable. A Rottweiler puppy that lacks confidence and benevolence can have temperamental issues. Selecting your new puppy is a very exciting event. Now that you know where to find a puppy and know what to expect as far as temperament, housing, and responsibilities, picking out your new friend is the final thing you need to do. When checking out the puppies, make sure you know what you want out of your new companion. It is important to be selective, don’t just pick out any puppy, they all have such different personalities, so make sure you select one that fits your lifestyle. If you have an active lifestyle, you may want to select a puppy that is high energy. If you are looking for a companion to take on your daily run every morning, select a puppy that is running around and very playful. If you are looking for a calm buddy to hang out with, choose a puppy that is more laid back and reserved. This way you don’t have a super high energy dog you cannot control or have time to wear down every day. When picking out your new puppy, always select the puppy that shows you affection and attention. If there is one in particular that shows a liking to you, it is always best to go with the puppy who chose you. This will no doubt be a loyal and happy companion for you. If you have a family, and the puppy is going to be a family dog, always include the family when selecting your puppy. It is important that you all like the dog and that the dog likes all of you as well. So whether you are adopting your Rottweiler puppy from a breeder, a shelter, or a store, make sure your home is prepared for the arrival of your new friend, don’t forget to find a vet, and choose a healthy, hardy puppy. Good luck on adopting your new Rottweiler puppy! Excellent article. You cover a lot of great points here. My neighbor has an amazing 9 month old rottweiler and he is the nicest guy you will ever meet!